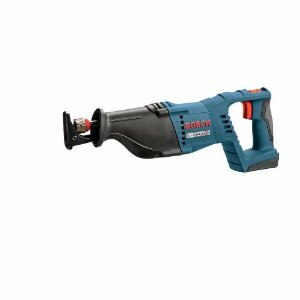 The Bosch reciprocating saw is one of the most reliable and efficient power tools among the competitors. Although the basic specifications of this reciprocating saw is similar to its other counterparts in the market, such as a variable speed trigger, a two speed setting that varies between 2,400 and 2,700 rpm and a 1-1/8 stroke, the similarities end here. The first difference that can be felt between the Bosch saw and other reciprocating saws today is in its overall balance. The weight is evenly distributed across the entire saw, although the total weight is standard for any other reciprocating saw, at 7.6 lbs. This even distribution of the weight of the machine shows the care and skill with which each of these machines are manufactured, as well as its overall quality. Another positive feature of this saw is the presence of the D-handle, which is large and can hold a big hand or those hands that are wearing large gloves. The front handle is big and comfortable as well, with a lot of room for holding on to the reciprocating saw even when it is working its hardest. Looking at the blade locking system, the team at Bosch has nailed it with an impressive Lock-Jaw system on their reciprocating saws. The user can change blades with one hand, which is very helpful when there is a lot of work to be done and the extra hand cannot be spared. Even with an easy one-hand system, the locking mechanism is still very solid. The blade is tightly locked into the system and there are very few spaces through which debris can enter inside the chuck and jam the blade. The balance of weight and large gripping areas make the Bosch reciprocating saw a comfortable, easy to use machine. The Lock-Jaw system effectively locks in a blade and protects it from damage from debris, while still retaining its ease of use- the blades can still be changed with one hand despite the solid locking system. Looking at the cons, the only visible one which makes the entire package a bit off is the difference between the two speed settings. At 2,400 and 2,700 rpm, there is hardly an difference at all between these two presets. After seeing the overall performance of the Bosch reciprocating saw, it is clear that this is a great addition to the companys lineup of power tools. Although Bosch products tend to be priced higher than its counterparts, this particular tool is worth paying the price, and even some more. It is an impressive professional grade power tool. The Lock-Jaw and the overall balance of the machine is rivaled by no other reciprocating saw in the market till date. For its amazing features, Bosch Reciprocating Saw deserves a top rating of 4.5/5. Return From Bosch Reciprocating Saw Page to Home - Finishcarpentryhelp.com.